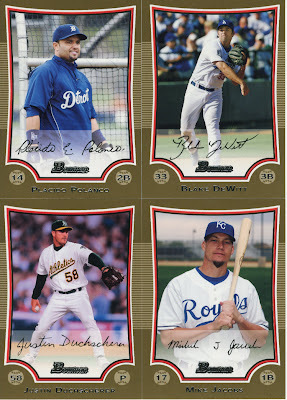 A Cardboard Problem: 2009 Bowman: Thumbs up or down? As most of you know, I opened a jumbo pack of 2009 Bowman the other day and listed the cards on here (if you don't know, you should scroll down and read it). The other day I picked up 4 retail packs at Target simply because there are 24 packs per box and all 24 were there when I got to them. The reason for the title of the post is because of all the WBC cards inside. I personally have no need for these players, nor do I want them in my packs. I couldn't care less about getting these. If they are actual prospects for MLB teams, then I guess that's fine but the ones I have here are not. What am I going to do with these? I don't know, but I am curious what you guys think about this. I scanned some of the cards I got out of the 4 packs. I don't think I did terrible as far as inserts go. I ended up with 4 gold, 1 blue, and a refractor even if it is a WBC card. I only pulled one rookie card. I am probably done with picking up packs of Bowman only because it makes more sense to just jump on eBay and grab Pujols, Lind, Cano, etc. and end up spending less money. Anyone pull any of my guys yet from this set? He's all yours. No trip to Target is complete without pulling at least one Chipper. 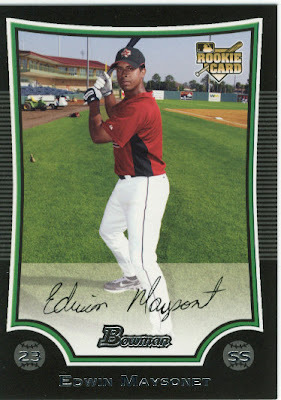 I would have been happy to pull the DeWitt and Maysonet cards, but I won't be buying any Bowman products this year just the same. If you want to trade me something for them, I'd send them out to you. The Darvish refractor is going for about $10 on eBay at the moment. It might be worth holding on to because many teams are scouting him with the thought that his team is going to post him once his current contract expires. I think that's still a few years away though. Bowman is a mess this year. I bought one jumbo and decided that was enough. Topps 2 is out now and Allen & Ginter will be out soon enough. Well, logic would dictate that if you're only really after 3 players then you shouldn't buy any packs of anything, ever. But that wouldn't be any fun, would it? That being said, I'm not really a Bowman fan, but I like getting the cards (Cardinals cards anyway) in trades. And I'm pretty sure Darvish is one of the most sought after WBC non-MLB players at this point, so it doesn't seem like you did that poorly. 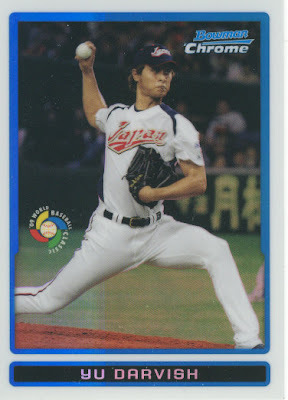 Interesting on the Darvish, I suppose I will hang onto that for a little while. Sounds like a good flip for something I might want in the future.